Throughout history, alcohol in general- and wine- in particular, has carried with it certain rituals, culture, ceremony, and history. A sommelier practices wine rituals almost religiously: the laying of the cork on the table, the decanting, the swirl, the sniff. One of the reasons I believe these rituals are important are the strong associations many have with the consumption of wine. The sights, sounds, and smells are often tied to significant life occasions. The clink of glasses over a meal with dear friends, the pop of a cork at a wedding, the blessing of a silver communion chalice: there are strong cultural and emotional associations with these rituals and the tastes that accompany them. Yesterday I attended the funeral of a family friend. As one of the few Americans at the service, I was surrounded by the funeral rituals of foreign cultures- in this case, Ukranian and Russian. Russians take their rituals seriously, and the traditions regarding drinking perhaps even more so. Wine filled many glasses. Cognac in others. 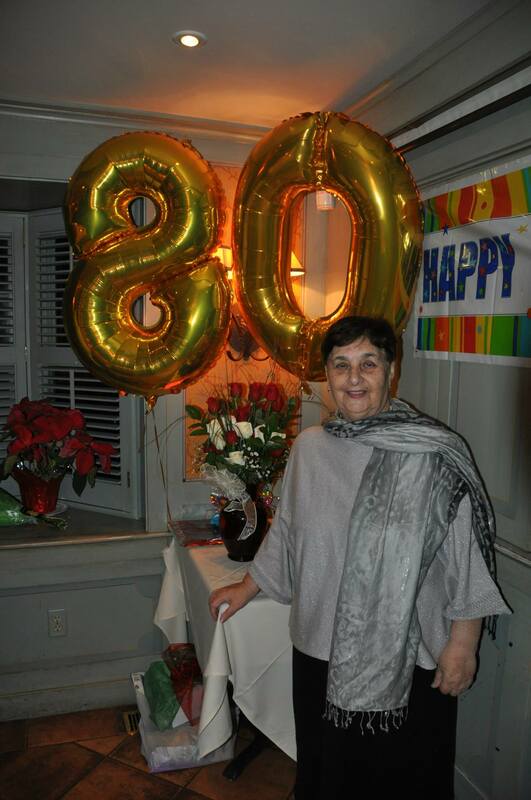 Bottles of chilled vodka were scattered liberally around the banquet room where loved ones had gathered after the service to mourn, to tell stories, to honor, and reminisce over a life well lived. 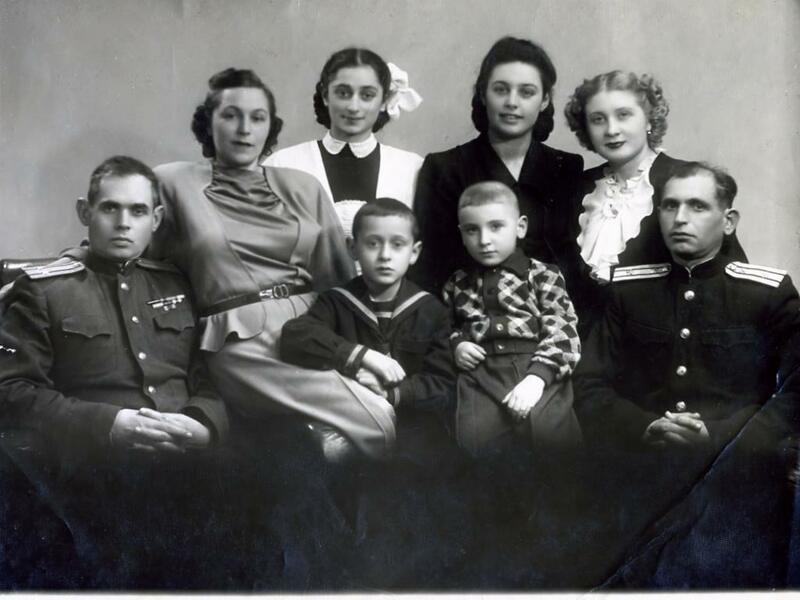 As I listened to stories in a foreign tongue, I could only pick out the occasional word: Grandmother. Very. Love. Absent from the day’s drinking ritual was perhaps my favorite Russian word of my very limited vocabulary: “na zdarov’ye” or “Cheers! To Good Health!” Its absence spoke volumes, even to my American ears. These rituals bring us together during times of triumph, sadness, religious sacraments, joy, mourning- an unspoken understanding among people of varying cultures and languages. It is on these occasions when the rituals outweigh any wine critic’s score or marketing pitch. 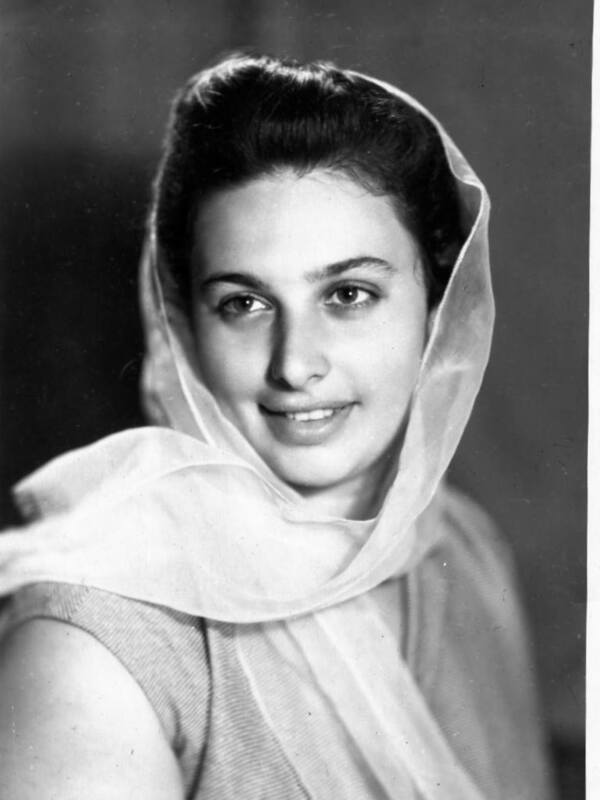 And so I raised my glass in communion with others to Larissa: a mother, grandmother, sister, and friend to many. When has the ritual of wine meant more to you than the contents of the bottle? With DC facing heat advisories for the rest of the week, I could think of no better time to recommend some of my favorite wines to cool down with during these dog days of summer. This Austrian grape offers crisp acidity, often with green apple and citrus notes. If you like Sauvignon Blanc, there’s a good chance you’ll like this, too! Aromatic, with lovely fruit notes on the palette and a dry finish, rosés are immensely food friendly. Gone are the days of syrupy sweet white zins! This easy drinking wine makes it chic to drink pink, and most can be had for well under $20! This lightly effervescent wine from Portugal is perhaps the quintessential warm weather wine. Vinho Verde is known for being refreshing & extremely easy on the wallet! The New York Times recently ran an article on this mainstay of summer libations, calling it “cheap and cheerful”. I would be remiss if I didn’t mention this grape, as 2013 has been dubbed the “Summer of Riesling”. 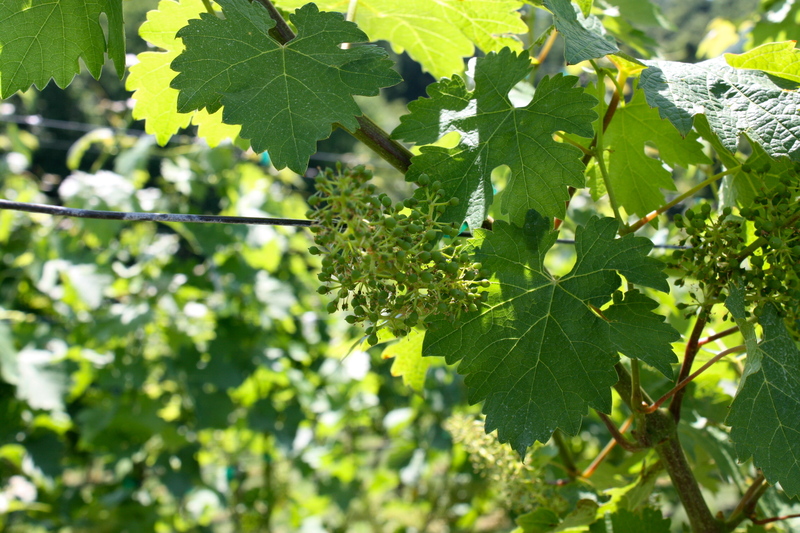 More versatile than many people realize, many Rieslings are actually dry! They can be quite refreshing and are immensely food friendly. Try one from the New York Finger Lakes, Austria or Germany! If you like your sparkling wine on the crisp side, Spanish cava is a sure bet to cool off these hot DC days! Want to taste some of my personal picks? I’ll be hosting a happy hour and teaching a wine class at Tabula Rasa on August 1 featuring wines to get us through the Dog Days of Summer in style! Check out the details on my events page for more info! 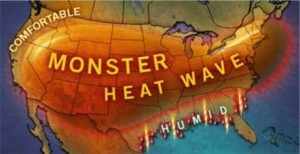 What’s your favorite wine to beat the heat? As a DC wine consultant, I’m often asked what I think about nearby Virginia wineries. To be honest, I haven’t always had an overly favorable view of the region. A visit to Linden Vineyards changed that. 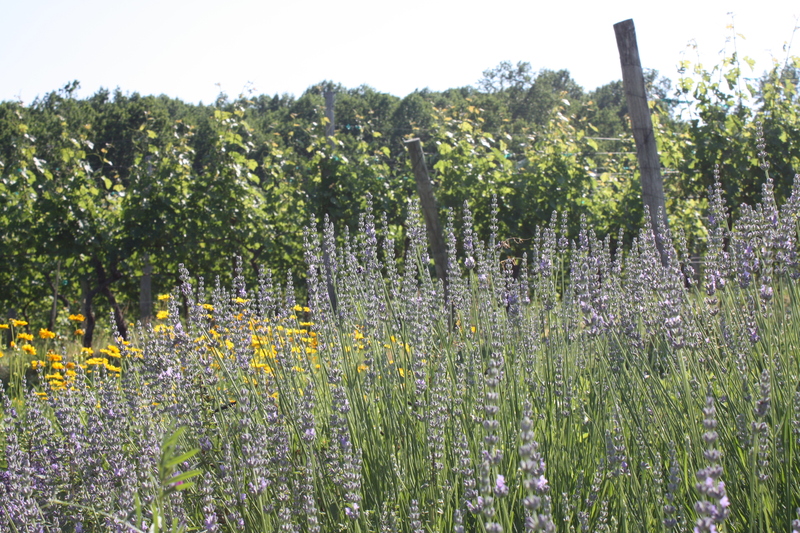 Jim Law, the owner, is particular about promoting what a Virginia winery can and should be. I found the results of his philosophy and commitment to quality wine-making refreshing. In a region addled by notoriously difficult weather conditions, Law is committed to producing wines to be taken seriously. Early Chardonnay grapes on the vines. Despite being in business for nearly 28 years, Linden’s vintners are constantly re-evaluating which varietals grow best on each site and adapt accordingly. 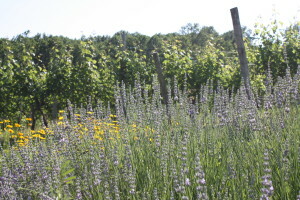 They display an overt commitment to the French notion of terroir, loosely translated as a “sense of place.” Terroir is about respecting the land, and letting wine grown in a particular place reflect its unique characteristics. 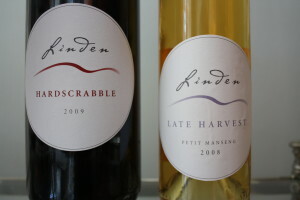 There is a definitive old world sensibility to the wines produced by Linden Vineyards. 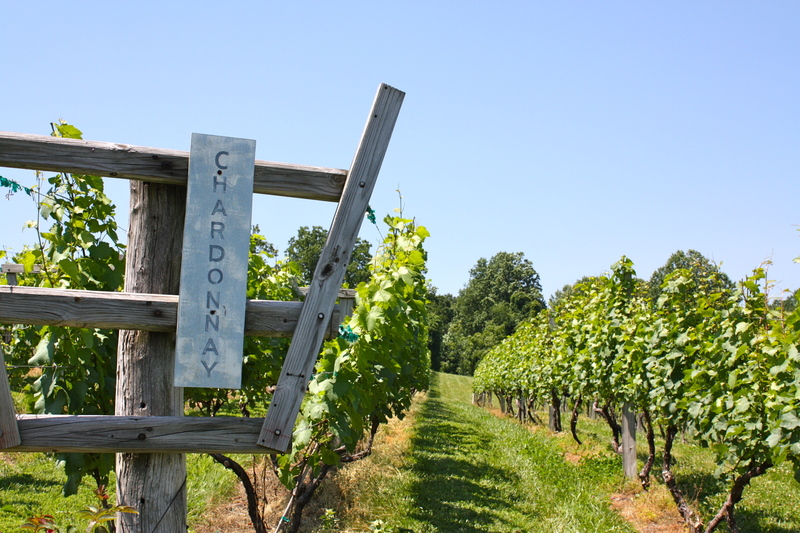 You won’t find Linden Vineyards in the Virginia guide to wineries, and they have a strict policy that limits groups to six people. There are no bachelorette parties, busloads of tourists, or even limos (which are prohibited) at Linden. Cell phones don’t work on the Hardscrabble property. The result is a tranquil respite that focuses on serious wines and a feeling of true escape from life’s day to day demands. When I met the owner, he came straight in from a day tending the vines, extending his calloused hand from sleeves of a wine splotched shirt. Jim takes bi-annual trips to France to taste and learn more about his craft. He’s less interested in the best vintages, but eagerly pursues knowledge about how French vintners contend with difficulties and challenging weather conditions- lessons that have served Linden well during the more difficult years. Long-time Linden employees, two of the cousins Chavez, tending the vines. 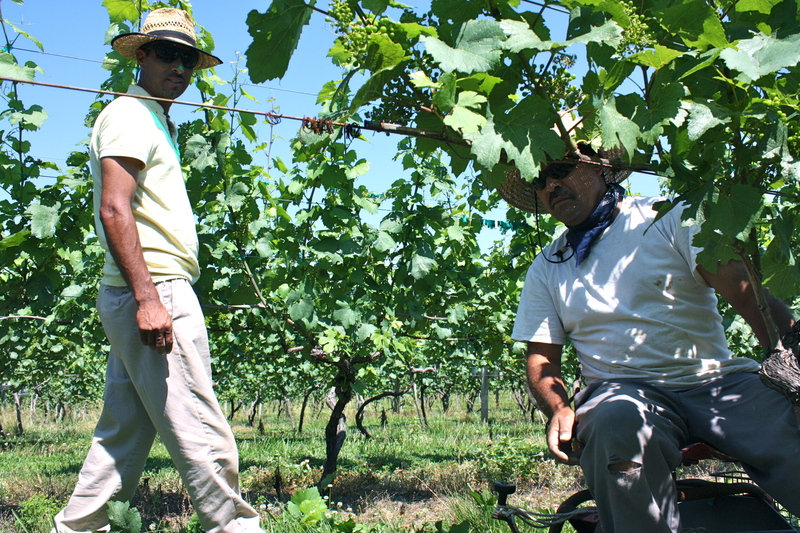 Every vine on each of Linden’s three properties is tended to an average of 12 times before harvest- a testament to both the staff’s respect for their product and fickle Virginia growing conditions. It’s this type of vineyard vigilance that allows Linden to adhere to a policy of non-intervention in the cellar. After touring the grounds and enjoying the reserve cellar tasting, we decided to forego another winery visit, opting instead to finish our afternoon on Linden Vineyard’s scenic porch with wine and charcuterie, a decision we didn’t regret. 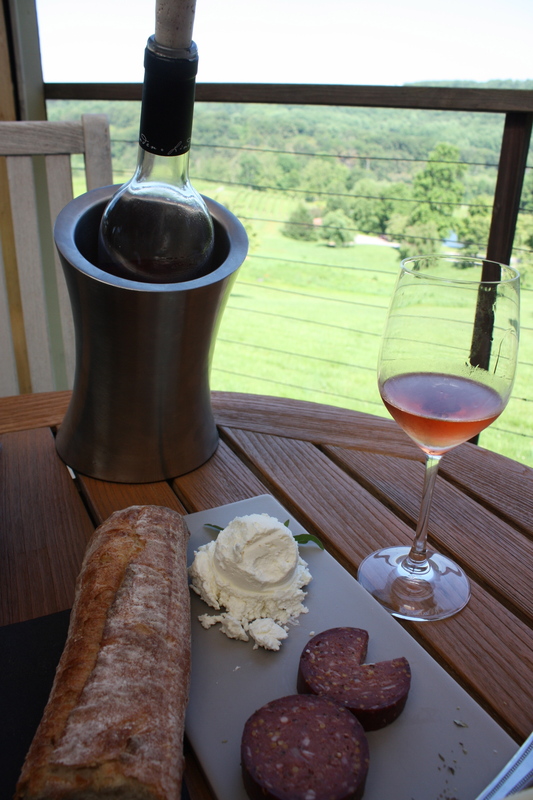 2011 Linden rosé with locally sourced cheese and summer sausage. 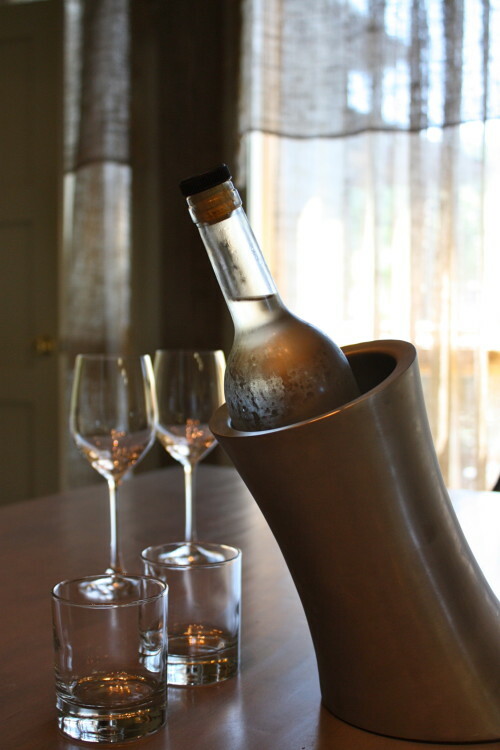 While the coveted seats are reserved for the vineyard’s most loyal clients on weekends, members of the case club, the tables are open to all clientele during weekdays. Linden produces around 5,000 cases of wine per year, and while they sell 95% of their wine on site, you can also find their products at high end restaurants and wine bars in and around DC. Visit www.lindenvineyards.com to learn more about their tasting room, reserve cellar tastings, case club, vineyard tours and more! We enjoyed all of the wines we tried during the reserve cellar tasting, but couldn’t leave Linden without these two standouts! For more behind the scenes photos, visit Bon Vivant DC’s facebook page! 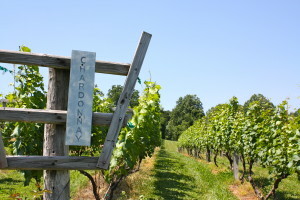 What do you think of Virginia wineries? Let me know the good, the bad, and the ugly! When we were kids, this rule was meant to encourage picky eaters to try new foods. But this lesson applies to wine drinkers, too. One great- and FREE- way to find a new favorite is at your neighborhood wine store. Most in the DC area offer free tastings on Fridays and Saturdays. Just ask when the next one is the next time you stop by for that tried and true! Not only are these tastings fun, they’re a quick, no-pressure way to taste several different wines for free. Wine experts offer samples along with a quick tutorial on what you’re tasting. You may not like everything you try, but you just may walk away with a new favorite! What new to you wines have you recently tried and loved?